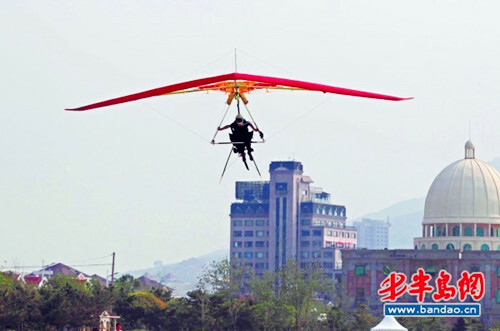 China's first hang gliding man successfully flew over Jiaozhou Bay in Qingdao, a coastal city of Shandong province, on July 7, 2012. Wang Yong began to fly at half past eight from Jiaozhou Bay and landed on Stone Old Man Sea 40 minutes later. 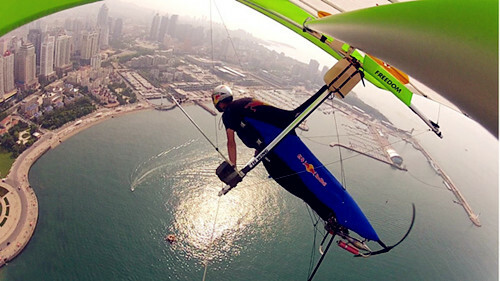 With 9.6-meter wings, the dynamic hang gliding can fly about one and a half hours. Wang learned the flight technique of dynamic hang gliding in France back in 2010. He now has plans to cross the Qiongzhou Strait in Hainan province, located in the tropical area at the southern end of China.